Nice and easy website to use. Nice and easy website to purchase. compatible QSFP+ works well , great! great service and best price . 120G CXP AOC(Active Optical Cable) integrates the design of 12-Channel VCSEL array and PIN array, providing 12 parallel data channels. Each channel supports up to 10.5Gbps transmission data rate, total 126Gbps bandwidth. Due to its non-exposed optical interface, 120G CXP AOC has no optical interfaces clean or contamination problems, which makes it can be flexibly arranged extensively with the cloud data center computer room. 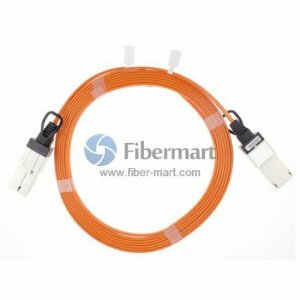 When using the 120G CXP AOC over OM3 fiber optic cables, the transmission distance can reach up to 300 meters. This product is suitable for 12x QDR InfiniBand Interconnection, meeting with IEEE802.3ba standard.